You might be an expert, you might be a beginner, but no matter how good you are, you can’t beat gravity forever. At some point, you will fall. When you do, you had better hope there you are wearing Forcefield Action Shorts to soften the impact. The bit that hits the ground first is often your backside, particularly if you are a snowboarder. Standing sideways to the slope means when your skills fail, it’s often your coccyx that hits first. It’s not just snowboarders either; skiers fall too and as anyone who’s had one will tell you, a cracked coccyx is as funny as a funeral. 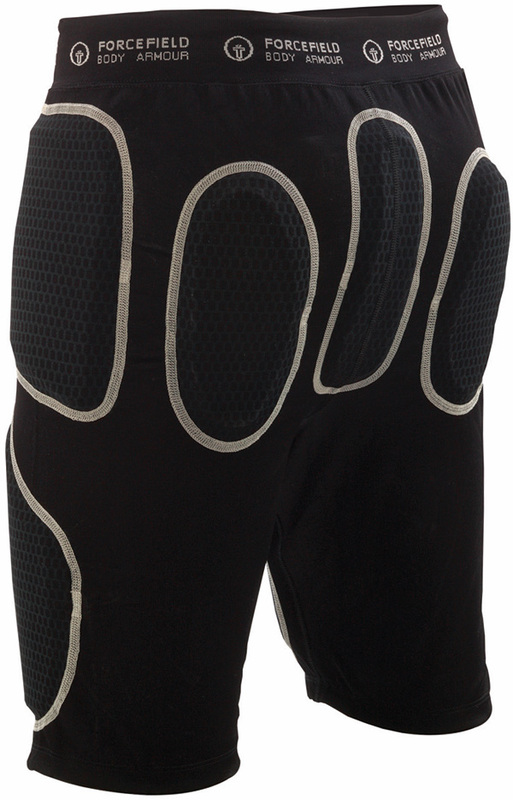 The Forcefield Action Shorts Sport are different from many other impact protection shorts such as Dainese or SixSixOne in that they don’t use hard shell pads. They look like cycle shorts and have a series of strategically placed pockets with removable pads. These pads are made from TPro® Dual Layer Armourflex, a patented, energy absorbing material. Although flexible this high tech substance dissipates the force of the evenly away from the contact point. It slows the rate of the impact by a few milliseconds and this means the force transmitted to the wearer’s body is decreased sufficiently to reduce or prevent injury. These shorts are very comfortable to wear. They are made from Lycra and once on you don’t notice the padding. Unlike some hard-shell protection shorts that feel like you are wearing a pair of incontinence pants. Because they are made from Lycra they are easy to wash. Just remove the protection pads from their pockets and chuck them in the machine. The fact that they are “soft” armour is the strength of the Forcefield Action Shorts, but it could also be their weakness. Care needs to be taken putting them on and taking them off as well as when the pads are removed and refitted as they are tight fitting and the stitching could be a weak spot. These are designed for multi-sport use, but the back doesn’t get as much padding as the front. The coccyx, rear of the pelvis and lower spine could do with a little more coverage than they get. Armoured impact shorts that don’t feel like they’re designed for a knight.